Can I just post this photo and a few lines, just to make sure I'm doing things right: haven't started a thread on this forum before. The extract from the Railway Modeller was the first in a series which achieved near legendary status. The first article appeared in August 1966. 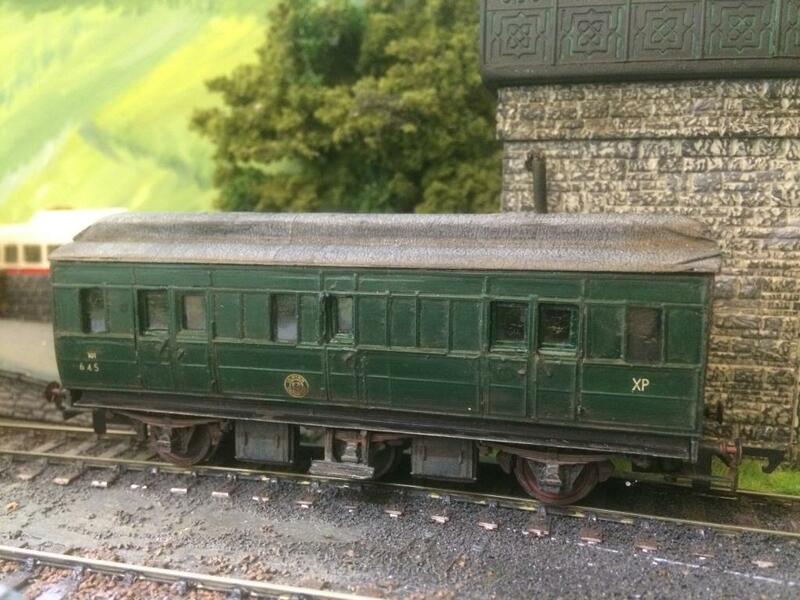 It dealt with the conversion of the Triang Hornby GWR clear storey coach into Southern Railway ( England) look alikes. Given the similarity to Irish coaches, I resolved to follow the plans. Only took me 50 years! 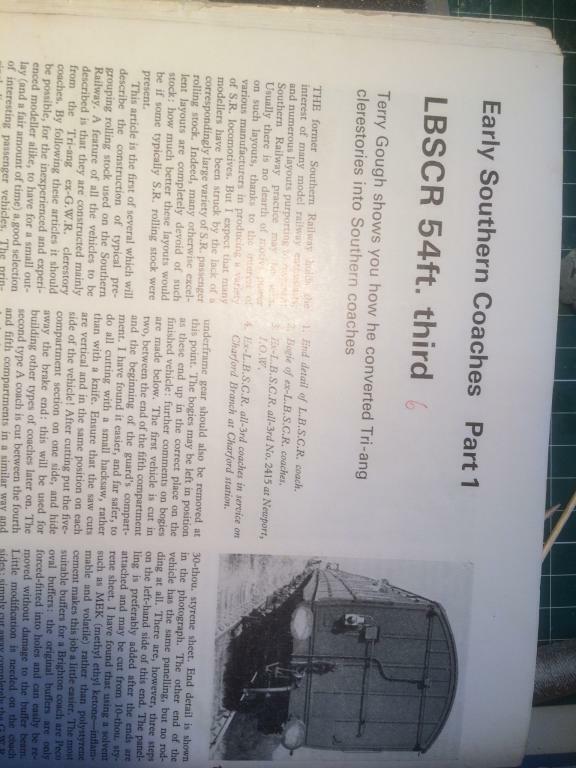 The original plan was for LBSCR 54 foot coaches but the similar GWSR/GSR coaches were 60 footers. Essentially you cut the passenger sections from two GWR brake 3rds and join them together. However, I decided to widen them somewhat, to replicate the wider dimensions of Irish stock. That involved some rather agricultural cutting of the sides away from the original chassis. 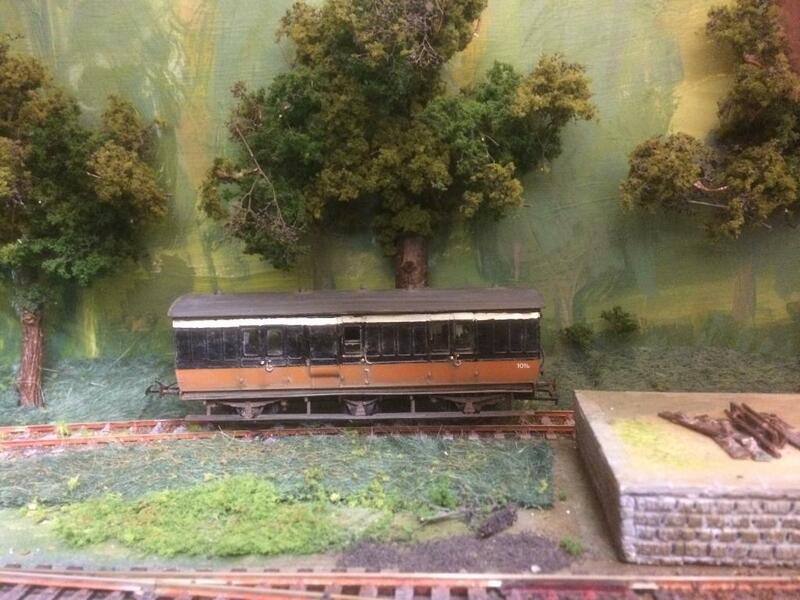 I also added some height to the coach using Evergreen strip. 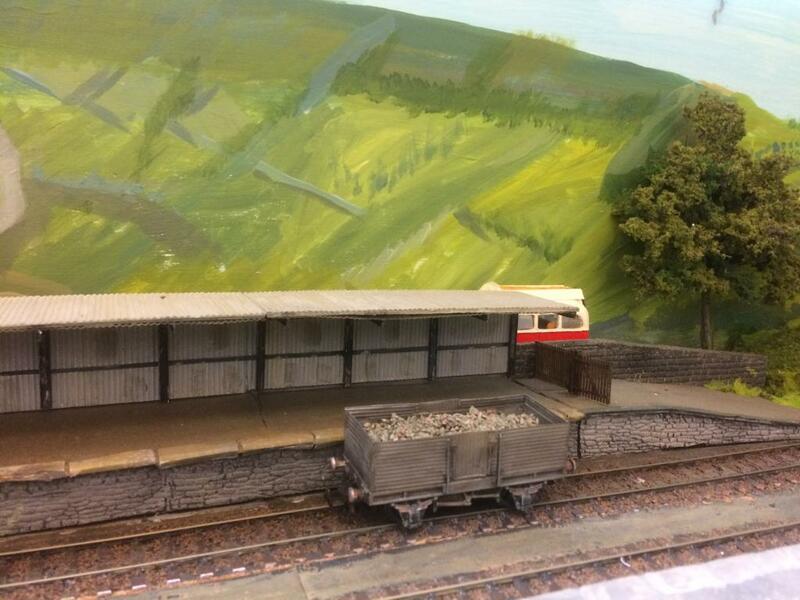 I scratch built new ends although the roof is BR Mk1. Welcome Glover to your new Workbench. 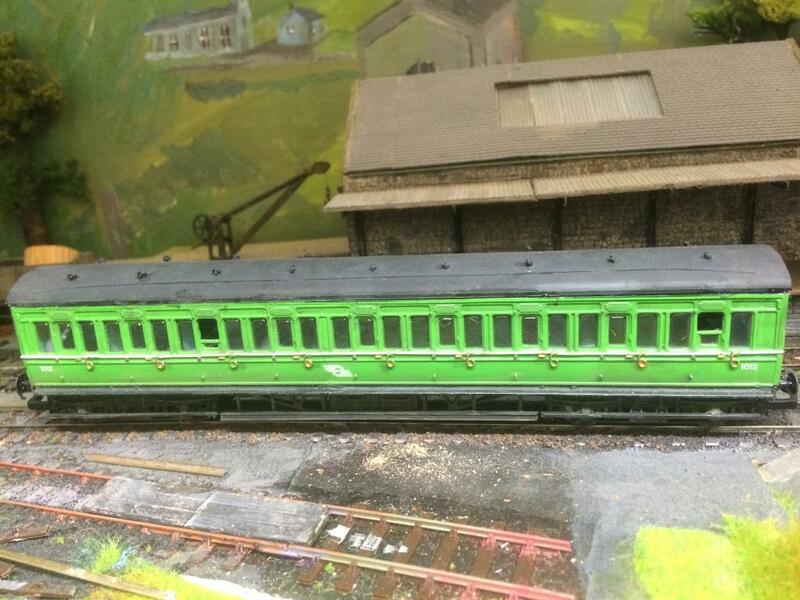 Great to see a GSR coach been modelled, looking forward to seeing more projects. Wow! That looks fantastic - keep it coming! Glover that is brilliant! Please keep posting. In the early 1900s, the GNR built new trains to run between Dublin and Belfast. Three of these 6 wheel clerestory guards/luggage vans were built, designated W1. There is a clear side on view of 247 in Desmond Coakhams' book, Irish Broad Gauge Carriages. The sides are modified from the Chivers Finecast LNER pigeon van. 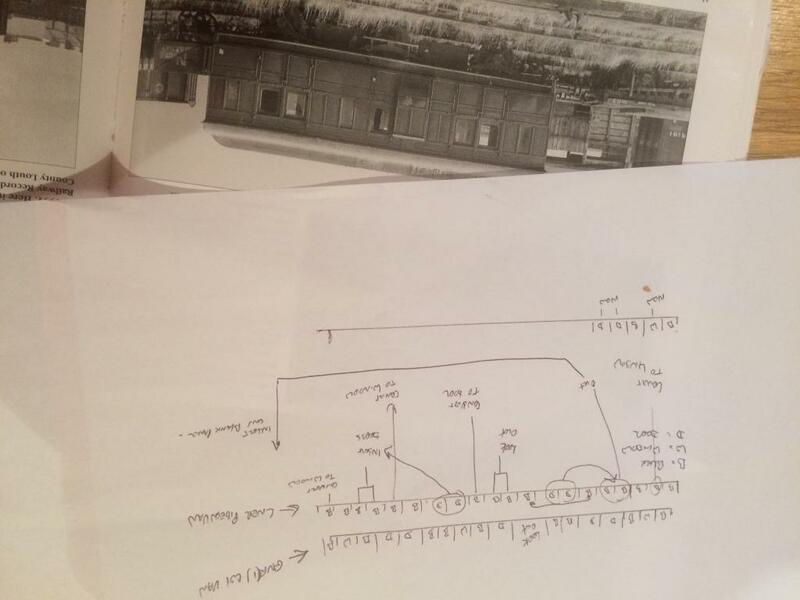 It requires a lot of cutting and shutting; I found it best to write out the door/window/panel layout for both the pigeon van as bought and the W1. Reducing the pigeon van by approx one panel reduces the overall length to 30 feet. You can figure out your own solution as to why one side ends up shorter (or longer...) than the other! The roof is left over from the Triang Hornby GWR conversion ( first post), covered with sticky address labels to replicate what appears to be a recovering job in the photo. The under frame is from the Ratio 4 wheel GWR coach kit, with an extra set of axel guards added; the middle wheel is a dummy. The van was photographed in 1959 but I've assumed it lasted to mid 1963. In that case, it's a toss of the coin as to whether it ended up with CIE or the UTA. 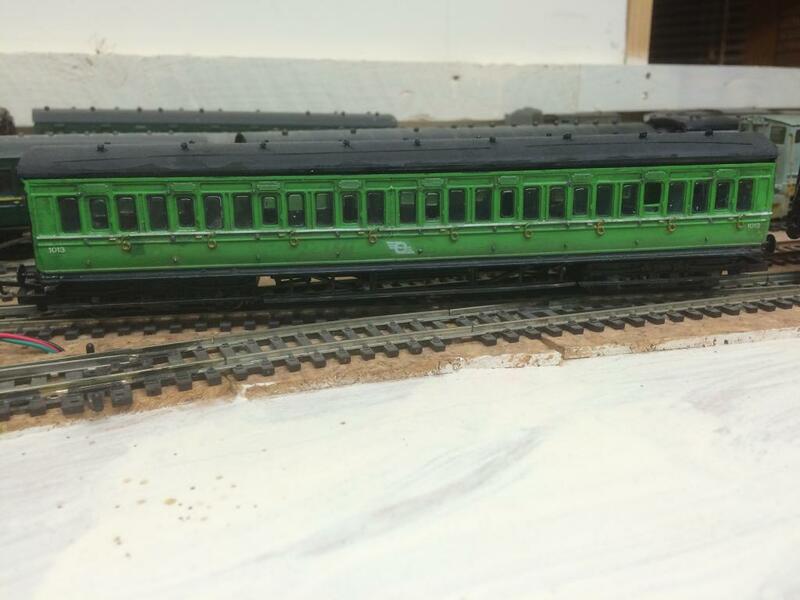 I've taken that as an opportunity to paint it light CIE green one side ( with a small "n" added after the number)and dark UTA green on the other. Yes, the UTA creast should be higher and, I see from the latest New Irish Lines, that I have chosen a number allocated to a different ex GNR van. I'll live with it! Note that there is a guards look out on one side only. Coakham says one was removed at some stage. Just for the record, according to my researches, the vans were numbered 247, 274 & 275. 247 went to the UTA, and the others were withdrawn in 1957 & 1951 respectively. 247 was withdrawn in 1959. Thank you Dhu Varren for that info. Coakham says one of the vans ended up in the Portadown breakdown train; do you happen to know which one? My layout is a continuous run but all sides against walls; I have to (remember to!) duck under, therefore only one side is ever visible. In fact, quite a few of my wagons are really only fully finished on one side. Apart from the fact that the vans never made it into ordinary UTA service, I'm still a bit unhappy with the lettering etc on that side. Am I right in saying that UTA numbering etc was in yellow? I followed, in general terms, the lettering on Y2 class 4 wheel van shown on page 63 of Coakhams' book. For those who might (in a moment of madness) be tempted to try this conversion, I should add three points which I forgot to mention earlier. 1. I made the CIE side first and didn't cut out the full range of windows. The UTA side (the better one!) has the full set. 2. In order to add some height to the van, I added a strip of Evergreen plastic along the top. On the Uta side, I actually off the top, including the small,narrow windows and then added the plastic. A better job I think. 3. 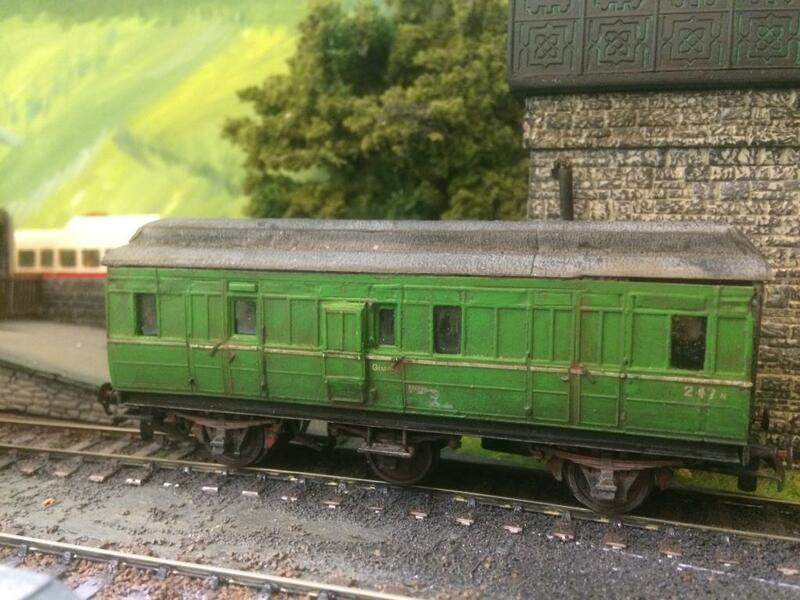 I used the end from the pigeon van kit but reprofiled it to match the Hornby roof. Lovely work, I like your colour you've chosen for the UTA livery, happy new year! Am I right in saying that UTA numbering etc was in yellow? No - it was a light creamy beige colour, like the lining. The RPSI livery is often assumed to be a base for UTA livery, though maybe you hadn't that, particularly, in mind. However, it is based on UTA livery, rather than being actual UTA livery; this being deliberate because none of the Whitehead set were ever owned by the UTA. It is this livery which has possibly given rise to people thinking that the UTA used yellow. The light colour used was edged with very thin red lines, though the lining on the numerals would be way too small (1/4 inch in reality!) to show up on a 4mm scale model. Very nice indeed. Keep it coming. Thanks JHB for the info re UTA lining. This 30 foot 6 wheel guards/luggage van appears in the many photos taken during the week long grand steam tour of Ireland in June 1964. It was I suspect built in the early 1900s, by the GSWR. It's a relatively straightforward job, involving the use of the guards section of two Ratio GWR 4 wheel coaches. I added a middle axel guard, cut from the Ratio under frame. The wheel is dummy; the flange filed off a plastic wheel. 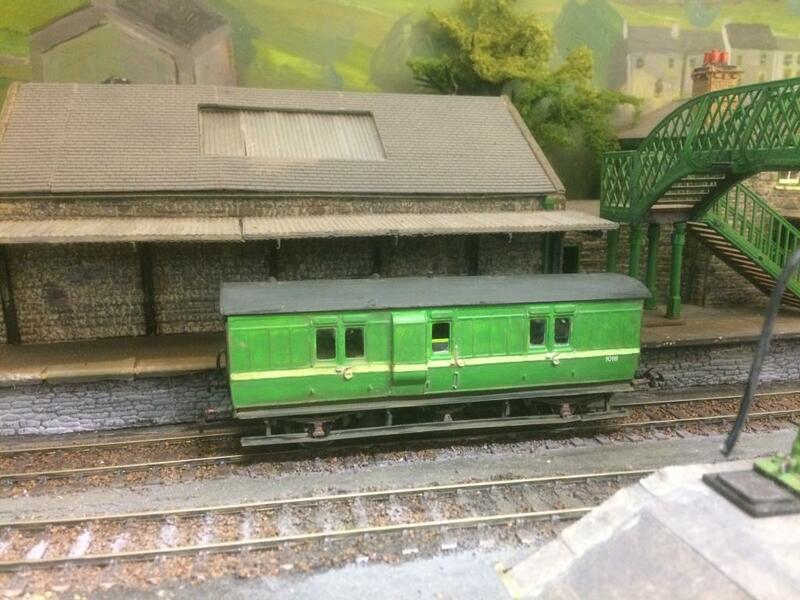 In the 1964 photos, it's painted in the then new Black and Tan livery but given that my layout is set in 1963, I think it reasonable to paint one side in CIE green. If I were doing it again, I would figure out a way to widen it, from the current 8 foot to something closer to 9 foot, thus replicating the wider appearance of Irish stock. There were quite a few six wheeled passenger brakes about - two as late as 1968 anyway. One of these was the 1964 one. The other was 69, now heavily rebuilt at Downpatrick. 69 was built in 1888. Your one was built probably 1895-1900. There were only these two six wheelers, possibly one or two more at absolute most, which attained the Black and Tan livery. Others remained green until withdrawn between 1960 and 1965. No passenger carrying six wheeler was ever black'n'tan. All remaining ones were in Cork as spare vehicles by 1963, and there appears to have been a single occasion in spring 1964 when a set of them not to Youghal and back. That was that, a far as six wheelers were concerned. The one you have modelled so well is of GSWR origin. It lasted at least until 1965 which is the last pic I've seen of it. However, the vast majority of surviving six wheelers were ex-MGWR, and thus, with no kit available for either the passenger or brake versions, this represents a major omission in the kit world - as does a standard Irish 30ft coach chassis. Some great modelling there. Those W1 vans really are very nice vehicles. There look to be some rather nice buildings lurking in the background too. Any chance of seeing more of these? 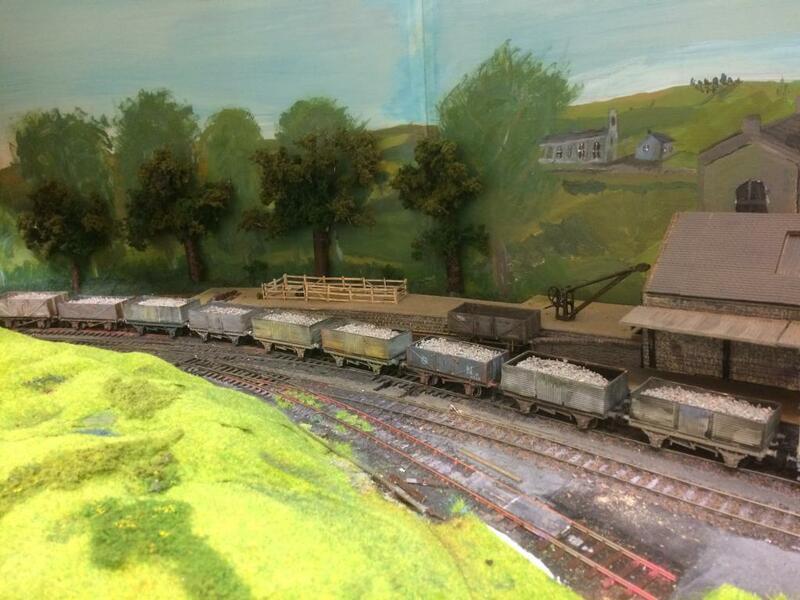 I'll do some notes and photos of my layout, in a few weeks time; bit busy with some other issues at the moment! In the meantime, some wagons. I don't know what the actual numbers were but Irish goods trains seemed to be made up pro dominantly from covered vans. However, we can justify some. This is the old Hornby Dublo 5 plank open. I bought it at one of the toy fairs last year for about €2 or €3. It was mounted on the old solid cast under frames ( although that didn't go to waste.....). I used a Parkside Dundas under frame kit with buffers from MJT; Irish wagons, especially from Inchicore often seemed to use relatively large buffers. The very basic brake gear is mostly from a Studio Scales Models etch which I bought some years ago. Decals are also from SSM. Before painting, I subjected the wagon to some " bruising and battering". Basically, just scratch at it and hit it with various implements; very hi tech stuff! Looks good Glover, the weathering is very impressive also. Going back to the carriage above, I'm just noticing it has curved in ends. If you wanted, you could look up numbers of former Waterford, Limerick & Western vehicles, as they were the only carriages in the entire GSR / CIE fleet which had curved in ends. Obviously, after 1901, ex-WLWR stock was absorbed into that of the GSWR, later GSR, but there were still a few nice survivors about in late CIE days. The family saloon, No. 900, is - I believe - still (in a very derelict state) in Belturbet. That is the only W & L vehicle left after the destruction by vandals of their former Director's Saloon at Mullingar in the 1990s. The wagon look's great, well done. Class Job. I have one of those Hornby Dublo wagons myself but it doesn't look anywhere near as good as your revised edition. Many thanks John, what a superb photo! I have to say I'm rather pleased with this little wagon. That Hornby Dublo moulding is as good as anything around today. It must be 50 plus years old. JHB: thanks for the info. I may have a second go at that GWSR Luggage Brake van; wider, a bit taller and flat ends. 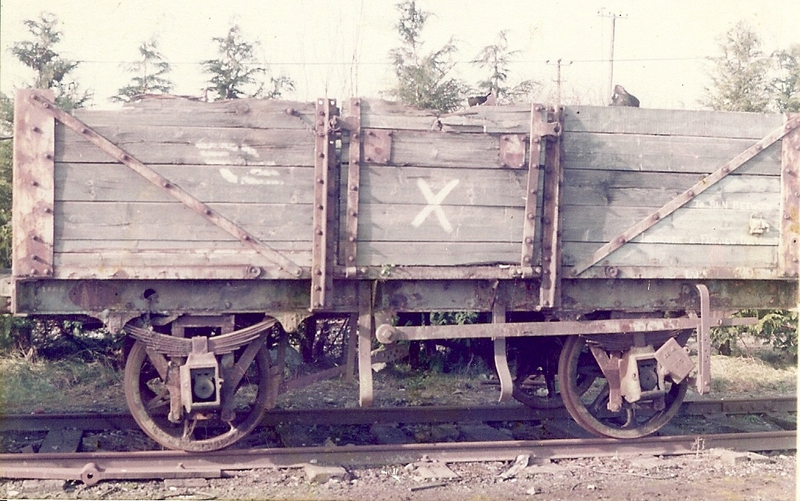 Irish wagons, especially from Inchicore often seemed to use relatively large buffers. Great job Glover! 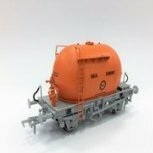 Re buffers, this is something we're replicating with our ballast and bubble wagons, making sure the heft of the prototypes is recreated in the models. One major drawback of a lot of RTR models is the anaemic and underscale buffers. You have got them spot on. There's an interesting thing above. On wagons, but on nothing else, the flying snail was painted on initially. In the late 1950s they started using a stencil for both snail and numerals, but painted snails were to be seen around well into the sixties, just like stencilled snails lasted well into roundel times! Above, we have a stencil on the photo, and the equivalent of a painted one on the model. Both ran together (as above). It would be good, given especially the advent of Leslie's "H" van, if a run on transfer of the stencilled flying snail was available. Anyone? 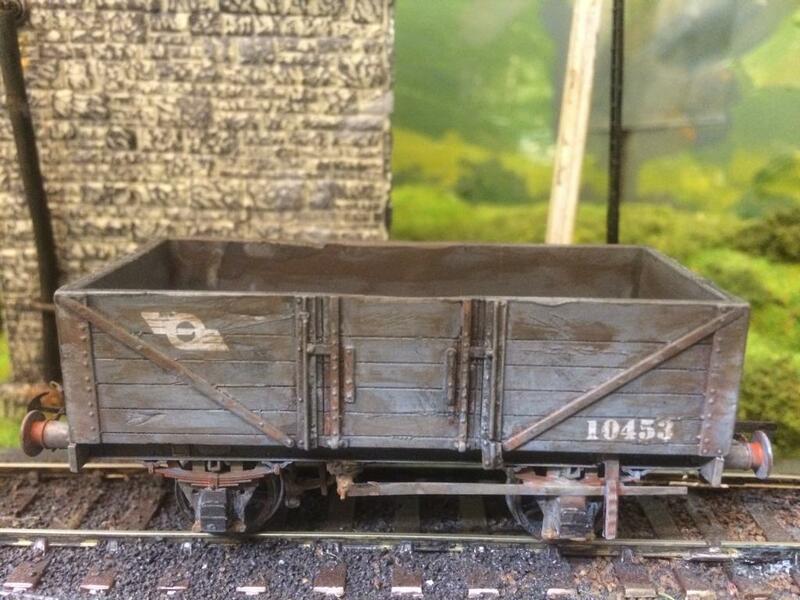 Very nice work on the wagons. The beauty about that one detail is that personal preference of either is prototypical! Especially pre-1965-ish! Incidentally, prior to roughly 1954 or so - not sure exactly - snails and numbers were painted in light green, not white. White seems to have started early to mid 50s, at which time the occasional faded "G S" was still about. I saw a colour pic somewhere of a light green version still (very work-worn though) about 1959. ... prior to roughly 1954 or so, snails and numbers were painted in light green, not white. White seems to have started early to mid 50s, at which time the occasional faded "G S" was still about. I saw a colour pic somewhere of a light green version still (very work-worn though) about 1959. Was the light green only on CIE introduced stock or was also used by the GSR? That included coaches and wagons? The GS itself was in white or just appears to be white in B&W photos? They were both applied with stencils. Depended on who was doing the painting, whether they were bothered infilling the blanks left after the stencil or not. Prior to about 1956-ish, all wagon snails were complete rather than unfilled-in stencils. After that almost all wagon logos were stencil like the photo above. I mentioned that the wooden bodied open wagon, as bought, was mounted on the (very) old Hornby Dublo cast solid chassis; it didn't go to waste, although some might feel it should have. For a number of years, I've been building up a ballast train, inspired by a photo of such a train at Bundoran Junction. The train is a mixture of wooden bodied wagons, including one with faded GN lettering and a representation of the Bullied corrugated open. I should say that I started making these before the Provincial Wagons versions were even thought off. The bodies are knocked up from corrugated plastic; possibly Slaters - I bought the plastic years ago. I retained the old HD couplings ; Peco still sell the equivalent as Simplex. Some of the wagons in the train are on chassis' that I had as a kid. They must be at least 50 years old. The whole exercise is a mixture of making-do/never throwing anything away and nostalgia. Just shows what can be done before Leslie (Provincial Wagons) came on the scene and made it easy for all of us.